Be important commuting arteries – connecting commuters to key business districts. Be paved (hard surface) or at least comprised of finely crushed gravel with an easy grade. Be separated from automobile traffic for most of its length. Meet the Cross Charlotte Trail , or XCLT as it’s sometimes referred to unofficially, a proposed 26 miles of uninterrupted, multi-use path stretching from the border of Pineville in the southwest to the border of Harrisburg in the northeast. For the entire length to be hard surface. To be mostly isolated from the road. To connect several important business and destination districts such as NoDa, Uptown, UNCC, PNC Music Pavilion (formerly Verizon Amphitheater), Carolinas Medical Center and Carolina Pavilion. The Cross Charlotte Trail began, as many crazy-ambitious ideas do, as an offhanded comment. In 2010/2011 city planners were studying potential bike routes/paths to parallel the extension of the light rail from Uptown to the University City area. In the short few years since, that crazy idea has caught traction with city leaders and was added to the City’s Capital Investment Plan. Last year, the City conducted a round of “pop up” meetings—showing up at football games, concerts, and festivals—to get feedback from the people who would potentially use, and pay for, the new trail. The results would set the sense of urgency for the project. In November of 2014, voters put their money where their mouth was, passing a bond referendum for support of several local projects, including the allocation of $5 million to the trail. The total estimated cost to complete the XCLT is $35 million. Much of those funds are needed before shovels ever hit the trail. Of the money devoted to trail construction, the cost is not spread out evenly. Some areas will simply be extensions of greenways built along creeks. Since no other structures can be built in those flood plains and there are no roads to work around, the land is easier to acquire and use for trail. Urban areas are a different story. Frey says things get more expensive when you have to go under or over a road. And there are currently 14 such places (13 roads and 1 rail crossing) to consider in the current plan. The Cross Charlotte Trail is a joint effort, teaming up the City of Charlotte and Mecklenburg County. 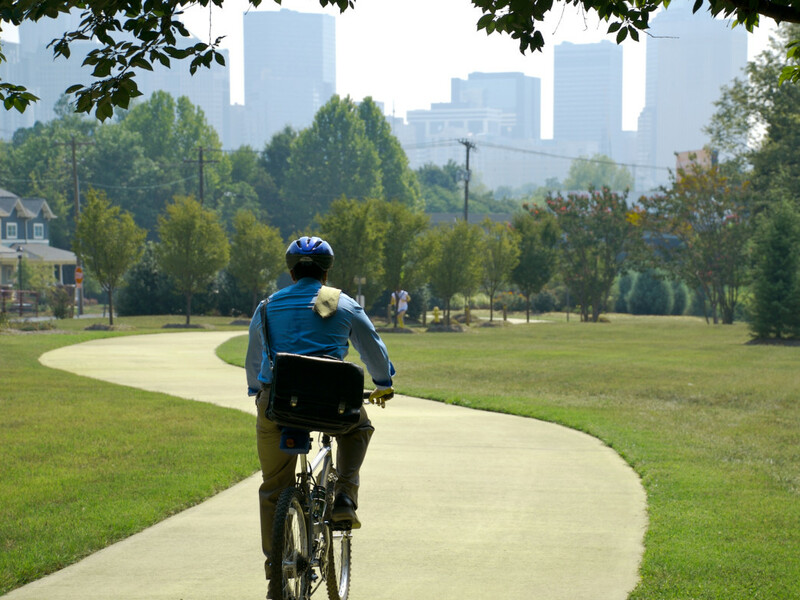 Many of the greenway miles will be the responsibility of the county; greenways are typically their domain. The city will help with a portion of the greenway sections and tackle the urban stretches. It will all, however, be a true team effort, including a partnership with the Carolina Thread Trail . “You may see several signs on some sections of the trail. One for a greenway, the Cross Charlotte Trail, and the Carolina Thread Trail,” said Frey. The return on the investment for the project can be great. Many of those who gave their initial thumbs up at the pop-up meetings were urban dwellers yearning for opportunities to enjoy time outdoors. For them, a trail like the XCLT is a prayer answered. But outdoor recreation is not the only reason to make such an investment. 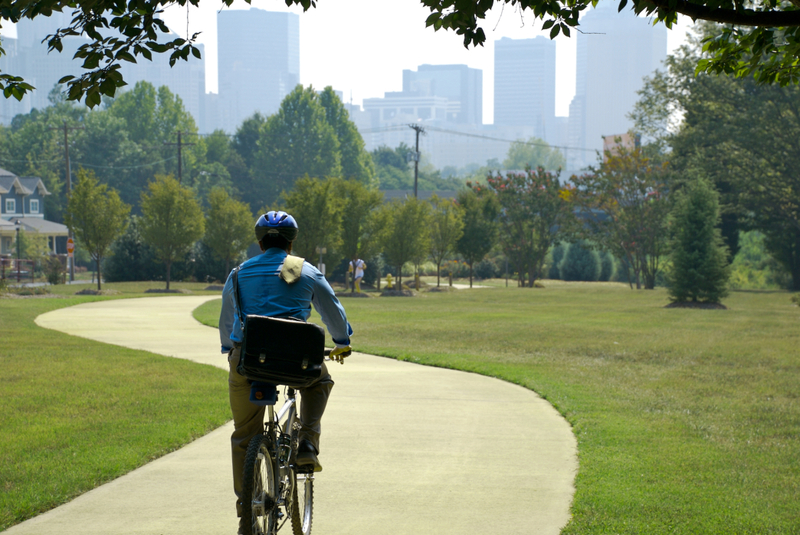 Urban trails rank high on the list for both young workers and retirees looking to relocate. And an increase in property values commonly follows construction of biking and walking trails, paying back the investment by way of property taxes. Other cities are making similar investments as well. Minneapolis, a perennial Top 10 bicycling city in just about every list of the sort, has some 50 miles of paved trail. Atlanta is well into construction of the 22 mile Beltline trail, an urban path that will circumvent the city using an historic railroad right-of-way and is expected to be the catalyst for all sorts of new development. In 2016, another bond referendum will ask Charlotte voters for the remaining $30 million to complete the trail. There is much to be figured out before then. The exact route, how to negotiate certain segments, and even the official name are still works in progress (although Frey did say the Cross Charlotte Trail moniker was well liked so would likely remain). For now, the city and county will use the initial funds to develop the master plan, conduct impact studies (economic, environmental and the like) and design and build a few sections of trail that make sense regardless of the fate of the full 26 mile plan. Throughout the process, the city looks to engage the public through surveys, a website , and public meetings . The first drop-in public meeting will be held on January 27 th from 6 p.m. to 8 p.m. at the Queens University facility at Marion Diehl Park, 2229 Tyvola Rd. The two questions Joe Frey encountered most during his pop-up meetings were: “When will it be done?” and “how close will it be to me?” At this early stage, says Frey, it’s difficult to give a completion date for the entire trail. Potentially, he said, it’s an 8 year project. 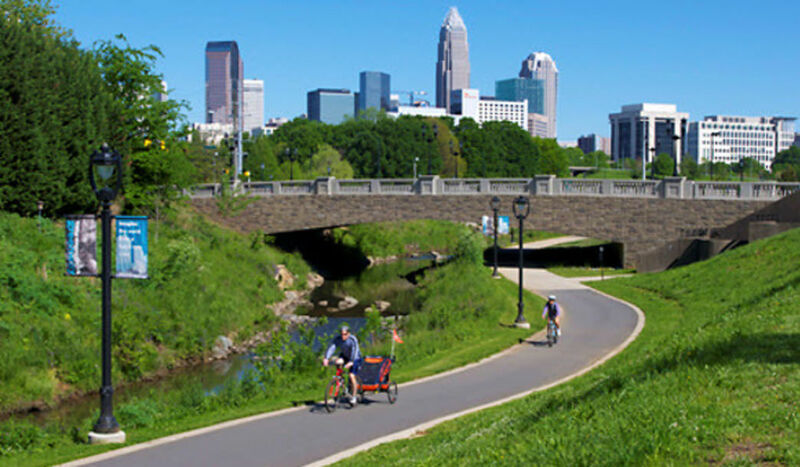 For the second question, there’s good news for a lot of Charlotteans: the city estimates that 80,000 residents and 96,000 jobs will be located within a half mile of the new trail. Certainly exciting times ahead for Charlotte cyclists and commuters.